Cuesta Blanca is a restaurant in Cabo Rojo, Puerto Rico. Essentially a fine dine, Cuesta Blanca has built up quite a reputation due to its fresh red snapper and Caribbean lobster preparations. They are one of the most famous restaurants for seafood in the area. As mentioned before, their best dishes are local preparations of seafood, and they serve a wide variety of lobsters. One of the tourist favourites is the massive grilled lobster, which is fresh and roasted to perfection. They have many dishes that will be hard to find on other menus. Be sure to try out something unique, like the octopus preparations or the shrimp in butter garlic sauce. They have a basic but tasty range of desserts, from Tres Leche cake to multiple flavours of flan. 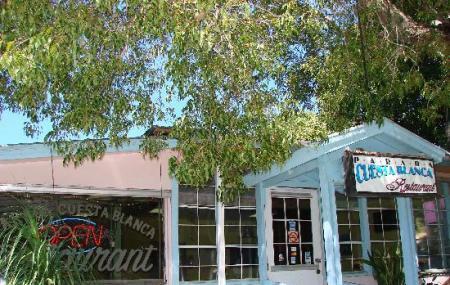 The interior decor and ambience is typical of a locally owned place that has been there for 30 years, which adds to the charm of Cuesta Blanca. Visit Cuesta Blanca in Cabo Rojo if you’re in the mood for some fantastic seafood, but don’t mind a lovely, homely atmosphere as well. If you’re ordering a fish preparation, make sure they let you pick out the fish and look for a clear colour in the eye. How popular is Cuesta Blanca? People normally club together Vaiven Tasca En El Mar and Miski Mikuna while planning their visit to Cuesta Blanca. I love this place. We stopped here for a cold drink and decided to stay there for a nice dinner. The food was great and it was quickly served by the staff. The beverages were cold and served by an attentive staff. Excellent experience. Really great seafood! Old school mom and pop Restaurant nothing fancy, just really good food.